A snapshot of the underground bunker. Building overground is great… but what about working underground. Those little secret bunkers left over from the cold war that are being turned into dwellings. Here’s a version for minecraft. There are two important variables that set the depth (it’s still there as tower height as a throwback to the last post) and the width. If you go too low (perhaps only to 5 or less) then the stairs don’t work. 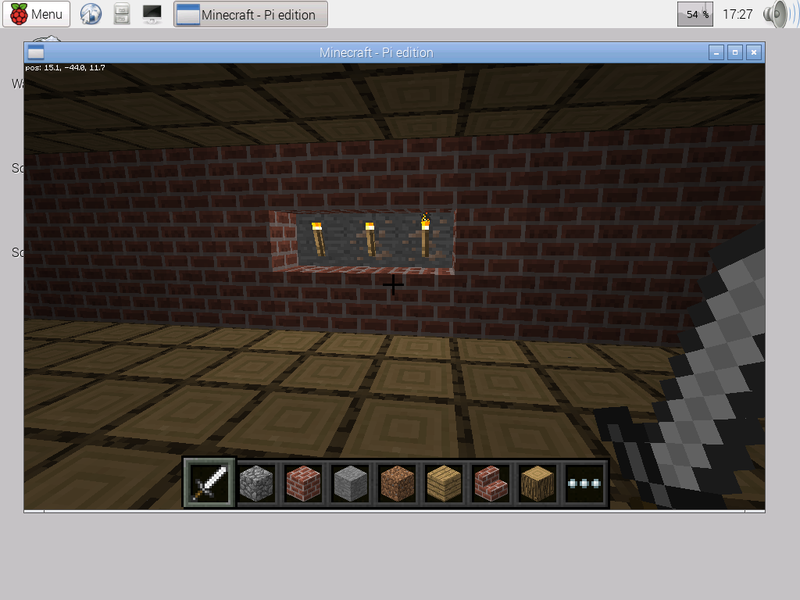 The torches get placed in funny positions sometimes or end up scattered on the floor. I think it’s to do with the fact that I haven’t put in facing-directions yet, but I’m not sure. This could be interesting if started not far from a cliff-edge – you could then tunnel in to meet it somewhere. The bunker position is based on where “Steve” is standing at the moment the script is run. Edited… some of the indenting went wrong last night! This program creates two towers next to each other. They’re rather sparse, having only four windows, an entrance door and a staircase to the top. It’s possible to walk up the staircase although you’ll get pretty dizzy in the process. I need to edit the program to stop it putting a useless staircase right at the top, but other than this it’s quite effective. Perhaps with a little work it would be possible to populate the minecraft world with a whole range of flats – even maybe using random for different heights and positions. Another refinement would be to clear the space it occupies so that you don’t have to remove the trees and landscape from the placement position.